This robot unleashes your creativity! Joint the Robot Revolution! 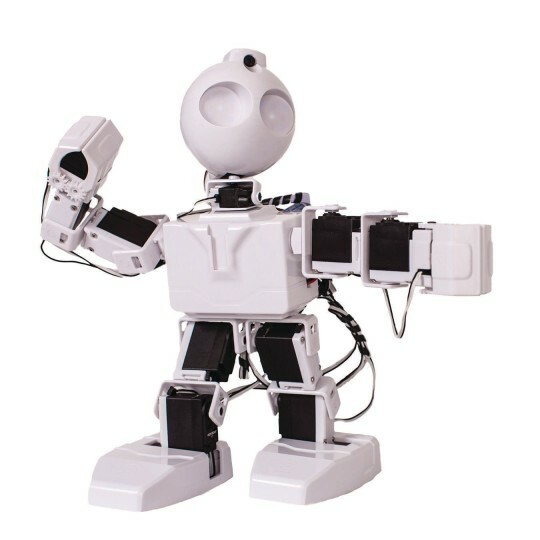 JD is a fully functional humanoid robot kit, built with ez-bits. It boasts 16 degrees of freedom with metal gear heavy-duty servo motors! JD can be controlled with your computer, Wii remote, Xbox controller, Smart Phones and Tablets, or even just your voice! The camera in JD's head can be used for vision tracking and recognition – color, motion, glyphs, QR codes and faces. Each eye has 9 RGB LEDs, which can be programmed for a variety of expressions.